On Monday, North Korea fears faded, and despite misses on Chinese Retail Sales and Industrial Production (0200) and Eurozone Industrial Production (0900), all indices rose, with SPX putting in its best day in three months. Similarly, USD was up against all currencies and gold and 10-year US bond yields were also up. Only oil bucked the trend, it was down $1.50 on the Chinese data. Tuesday saw mixed data in the European session, with German GDP miss, working day adjusted beat at 0600, mixed UK Producer Price Index at 0830, together with an UK inflation miss. Once again GBP sold off in advance of the print. The US releases were all beats. Retail Sales at 1230, Import/Export prices at 1330, and the NAHB Housing Market index at 1400. It was strange therefore that DAX, FTSE and NKY were up, but SPX was slightly down. The position was clearer on USD, which like the previous day was up against other currencies and Gold, in particular GBP, due to the inflation miss. Bond yields were also up, and Oil recovered a little of the previous day’s losses. Wednesday saw the disbanding of Trump’s Business Council, after many leaders resigned following the President’s refusal to condemn white supremacists. Also the FOMC Minutes were dovish, suggesting that give the inflation outlook, the bank could afford to be patient in balance sheet normalisation. This probably accounts for why SPX was flat, whereas the other indices rose, FTSE following the UK unemployment beat, a 42-year low, DAX following the Eurozone GDP beat. NKY was slightly down, despite a more pronounced JPY strength. The effect of the negative US news was felt more strongly in currencies: USD was well down against all majors and Gold, and bond yields were down. Oil was down against, despite the WTI EIA crude stocks beat, probably because of the miss on gasoline stocks. 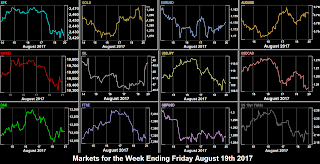 Wednesday’s news took effect on equities on Thursday, further depressed by the terrorist incident in Barcelona, and the (in the end, false) rumour that National Economic Council Chair Gary Cohn was resigning. All indices were sharply down, SPX giving up 1.5%. Currencies were mixed. 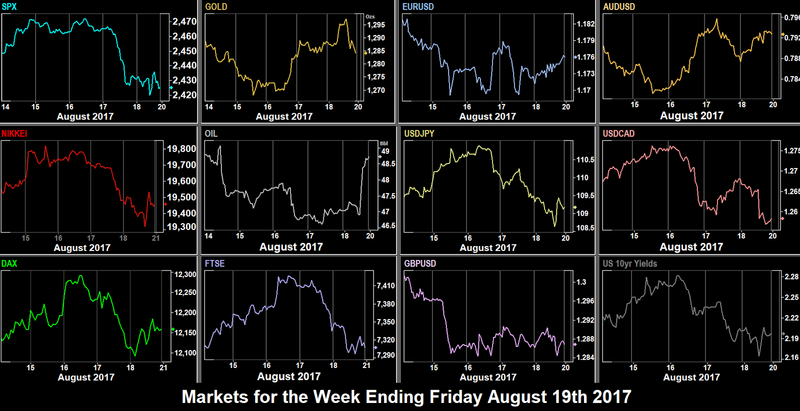 The equity mood was reflected as classic risk-off, as gold held the previous day’s gains and JPY was up again, and bond yields faded further. However, USD recovered some of its losses against the other currencies, for different reasons. EUR faded as the ECB voiced concerns in the MPC Accounts (1130) about Euro strength, CAD was a delayed reaction to the previous day’s oil price. AUD had risen the most on Wednesday, putting on 1.33%, rising another 0.39% on the Australian jobs print at 0130. At 27.9k (vs 20k) this is equivalent to a 373k NFP figure as the US has 13.4 times the population of Australia. However it then gave up all these gains to finish slightly down on the day. Oil recovered a little to close around $47. Friday started quietly until news started to flow that Trump’s Chief Strategist Steve Bannon had been fired. The equities market was very mixed. SPX ended up down slightly, or more to the point, it did not recover from the Thursday drop. If Cohn wasn’t leaving, then Bannon was, the market seemed to say, and this is despite some in the market thinking the exit of Bannon is a good thing. In any event, the long standing SPX 2450 support had been broken. FTSE was also down, but DAX rose, reacting to the ECB Euro comments (and its subsequent decline). NKY was flat on the day after a dip down. Notably DAX, FTSE and NIFTY all had an inside week for the first time in months. Currencies were similarly mixed. USD was down again AUD, CAD and EUR, in each reversing Thursday. It was however flat against JPY, GBP and Gold, the latter after a spike up to touch the psychological $1,300, from which it quickly retreated. Yields were flat after a dip down. There was huge spike in Oil which rose 3.26% in 50 minutes, starting at the European close at 1530. This has been variously put down to an unconfirmed report of a unit shutdown at a Texas refinery, the reduction (of 3) in the rig count (actually not published until 1700), but what is more likely is the exiting of weekly short contracts, and September contracts which expire next Tuesday. Contango into the October contract (“10-Oil”) is now 17 cents. The most important scheduled news this week is the Jackson Hole Symposium. This event, hosted by the Kansas Fed in Wyoming every year brings together the world’s central bankers. Of particular interest is Mario Draghi’s attendance. Of course at any time in the week we could get a surprise from the White House, following the surprise departure of Steve Bannon on Friday. We always say that in the absence of news, technicals come to the fore, and although mixed, the bias does seem to moving to the downside in equities. On Monday, as continental Americans enjoy the first total solar eclipse for 21 years, joint military exercises between the US and South Korea commence, which could resurrect North Korean tensions, which were drowned out by US political events last week. An obvious reaction by Kim could be another missile test. We will be watching GBP in advance of UK PSBR at 0830. Tuesday sees a speech by ECB Vice President Vitor Constancio at 1200. Minor news includes German ZEW Sentiment (forward looking) and Canadian Retail Sales. Wednesday’s news is PMIs, but Mario Draghi is speaking in Lindau, Germany, at 0700, presumably before he flies off to Wyoming, and Fed Kaplan (centrist) speaks at 1305. Otherwise another light news day, with PMIs and the EIA stock print. Jackson Hole starts on Thursday, although the main speeches are on the following day. Another chance to test the UK ONS leak theory as UK GDP is released at 0830. On Friday, Janet Yellen speaks before the US bell, and Mario Draghi speaks five hours later. Yellen’s topic is financial stability. Commentators are expecting more hawkishness than the last FOMC minutes, i.e. that balance sheet normalisation pace should continue, in line with recent comments by the normally dovish-leaning Fed Dudley We don’t yet know what Draghi will say, although given market sensitivity about ECB forward guidance, and concerns about EUR volatility, it may be that his speech is relatively anodyne, and in any event, there will only be two hours of the market week left when it is released.